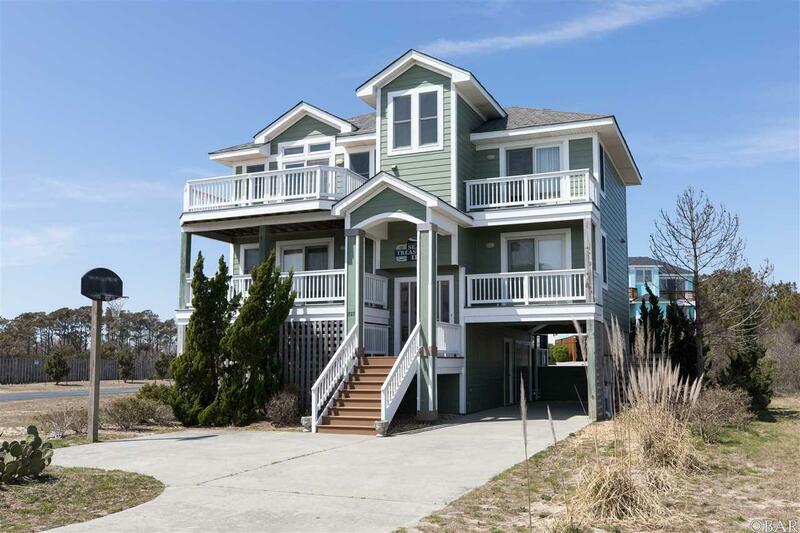 827 S Point Court, Corolla, NC.| MLS# 99962 | Outer Banks Homes For Sale, North Carolina Home Search Including Nags Head, Pirates Cove, Manteo, Kill Devil Hills Kitty Hawk, Southern Shores, Duck, and Corolla North Carolina, Oceanfront and Soundfront properties for sale and long term rentals. Just Reduced! Beautiful Ocean Views, Sunrises and Sunsets from this well maintained 5 Master Bedroom home with Pool, Rec Room and straight shot to beach access. Strong Estimated 9.8 % Rental Projection. Spacious , Bright and Open well designed home with top level featuring Cathedral Ceilings, Large Kitchen, generous Living room and Dining room. Top level features a Ship's Watch and a Master bedroom with private deck access. The decks are expansive and 4 Master Bedrooms have their own private deck access. A half bath is located between the top and second level for easy access from the top level. The Mid Level boasts a sitting area with deck access and 3 generous sized Master Bedrooms. The Ground level has a Rec Room/sitting area, Bedroom with hall bath and access from Pool area to the bathroom. Pool area is very private and oversized with a Hot Tub. This home has lots of storage, is greatly elevated, and located in Flood Zone X on an Oversized Corner Lot in a Cul de Sac. Recent improvements are: 2018 Living Room Furniture, 2017 Down Stairs Refrigerator and Down Spouts on top Living Room Deck, 2016 Lower AC Unit & Pump, 2015 Hot Tub Cover, 2014 Painted Inside/Outside/Trim Painting, Trex Steps, Middle AC Unit & Pump, Washer, Dryer, Upstairs Refrigerator, All New Mattresses, 2013 TV Living Room, Top AC Unit & Pump. The Monteray Shores HOA Community amenities are fabulous with Pool, Fitness Center, Boat Ramp, 2 Board Walks showcasing the Sound, Tennis Courts, Basketball Courts and Play Ground. Home has been a true second home for several years. Estimated Rental Projection for Advertised Gross Rental Income is $43,215 which is a 9.82% GRI. If you are looking for a lovingly maintained home with beautiful Ocean Views, Sunrises and Sunsets, 5 Master Bedrooms, Spacious, Flood Zone X, Private Pool area and Rec Room, then this is the home for you!